I have edited many articles and books with Arabic names and terms. Because of my language skills, I can often answer questions about romanized Arabic that colleagues ask in e-groups or to me directly. For example, a copyeditor once complained about the variant spellings her author was using, such as Kamal and Kamel, and asked which way she should fix them. Editor, beware! There are a lot of pairs or triplets of Arabic names that you might think are the author’s careless spelling when in fact they are different names. Don’t be too quick to correct, but do query. Kamal and Kamel (or Kamil) are different names, Kamāl and Kāmil, respectively. Another common pair is Salah and Saleh (or Salih), which are Ṣalāḥ and Ṣāliḥ, respectively. 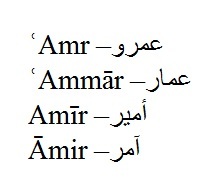 There are several names romanized with a-m-r in English, but not all are from the same root: Amr or ʿAmr; Ammar or ʿAmmar; Amir or Ameer; Aamir or Amir (see image below). The last is rare but I came upon it while doing a quality control edit: there was a caliph known as al-Aamir. That one is hard to spell without diacritics; the double a is ugly, but Aamir and Amir have different meanings and should be distinguished. And be aware that in addition to there being multiple ways to spell Muhammad, there is another name that you might think is a typo but is not: Muhannad. What Does All This Mean for a Copyeditor? If the text is academic English, romanization with diacritics will eliminate the ambiguities between similar names and terms. However, you do have to keep a careful watch for mistaken variants, such as an author forgetting a macron or a dot under a letter. In my experience, software to catch inconsistencies does not catch them if they involve special characters with diacritics. Whether or not the author uses diacritics, keep a detailed style sheet — which you should do in any case. Record the first instance of every romanized name or term, and check every subsequent instance of it against your record. If there is any variation, correct it if you know enough Arabic to check it and do so, or else just flag it for the author to check and put the variant spelling on the style sheet. There is always the possibility that there are in fact two different but similar names or terms. Dealing with terms and with names from the classical era of Islam is easier in that there should not be variation within a text. A name such as Yūsuf might be spelled Yusuf without diacritics, but if there are multiple people with the same name in the text, the name should be spelled the same way for all of them. However, the same name from the current or recent centuries might have various spellings for the reasons I gave in Part 1. Without diacritics, Yūsuf could be spelled, for example, Yusef, Youssef, Yousef, or Yousuf. Of course, if there is a common or preferred spelling of a particular person’s name — especially if that person wrote his or her name in the Latin alphabet — that is the spelling that should be used. When you are editing, if the variant spellings of a name are clearly referring to the same person but you do not know which spelling is correct or preferred, keep a record of them and query the author. If they are not referring to the same person, the “variants” might in fact be two different names, as I noted above. If you are editing a memoir, history, or other material where there are several people with the same name but different spellings, make a note in your style sheet to identify each person (“sister of the author,” “financial minister,” etc.). Another source of apparent inconsistency is names that in Arabic change the final vowel in the genitive. Many names are formed with Abu (Abū) plus another name, for example Abu Bakr (Abū Bakr) and Abu Taleb (Abū Ṭālib). In Arabic, the nominative Abū changes to Abī in the genitive, but in English the nominative ending u/ū should be retained. Untrained translators often keep the Arabic genitive ending i/ī when the name follows a preposition — for example, “She gave the money to Abi Bakr” rather than “to Abu Bakr” — but I correct Abi to Abu. In most transcriptions an exception is made when Abu is preceded by ibn (“son”) or bint (“daughter”). Then the genitive is kept because the full name in Arabic will always have the genitive: Asma’ bint Abi Bakr, Ali ibn Abi Taleb. If you see bint Abi [something] or ibn Abi [something], you can keep Abi. If your author has consistently kept Abu after ibn or bint, query it. Some publishers might prefer to keep the nominative form of the name in all cases. Fortunately for the editor, she did not have to do anything. The author was presenting the singular and plural forms of the words. Arabic has more than ten plural forms, so this is often necessary. In the first case the word has a broken plural in which letters are inserted, and in the second case the word has a regular feminine plural and only the ending is shown. This would be understood by the book’s intended audience. If you see a similar use of virgules when you are editing, it should not worry you. When you are proofreading, keep an eye out for Arabic names and terms that are split and hyphenated at the end of a line. It is best to not divide them except after the definite article al- or ibn. The letter pairs dh, gh, kh, sh, and th can represent the end of one syllable and the beginning of another, or they can be digraphs (two letters representing one sound), in which case they must not be split. If either letter of the above pairs has a dot or other diacritic, the word can be divided between the letters if necessary, according to New Hart’s Style, but The Chicago Manual of Style says the word can be divided only if both letters have a dot. Vowel digraphs (ou, oo, ee, aa) and diphthongs (ai, ay, aw, au) must never be split, and words must not be split before or after hamza, which is represented by an apostrophe or ʾ. In Part 3: Spelling the Definite Article and Part 4: More on the Definite Article, I discuss some of the editing questions raised by al-, the Arabic definite article. As a native English speaker and editor in Cairo, I am often asked how to spell a name or Arabic word “in English,” meaning with the Latin alphabet and for an English-speaking audience. A child’s name on a birth certificate, a name and address on a visa application, Islamic terms in a web article or book. English-speaking copyeditors frequently joke or complain about the multiple spellings of Arabic names (“twelve ways to spell Muhammad”), and other difficulties might appear in a manuscript. In this and subsequent essays, I explain why these differences occur, what you as an author or editor need to know, and how to use special characters if you (or your publisher) choose to include them. Transcribe and transliterate are often used interchangeably, but if Wikipedia rather than Merriam-Webster is to be believed, transliterate is to represent a word letter by letter from one alphabet to another, whereas transcribe is to represent the sounds of a language. Arabic does not write short vowels, so (according to Wikipedia) the Arabic كتب (“to write”) should be transliterated as ktb, which does not give enough information to pronounce it. A transcription would show the vowels: kataba. Some transcriptions, especially for linguistic studies, use the International Phonetic Alphabet (IPA) to show the precise pronunciation. I do not have expertise in such transcriptions and do not discuss them. For these essays I avoid using transliterate. I usually use transcribe for romanizing Arabic in more-precise ways using diacritics, such as in an academic text, and spell for romanizing without diacritics, such as in documents, newspapers, and trade books. My focus is on Arabic represented by Latin letters in an English text, as that is my area of expertise. Speakers of other languages that use the Latin alphabet, such as German and French, will have their own ways of romanizing Arabic. Several Arabic phonemes don’t exist in English. Among these are pairs that when spoken sound very similar to non-Arabic speakers. In less-precise English spelling, these pairs are usually represented by the same letter, but in more-precise transcription the emphatic consonant is shown with a dot or other diacritic underneath (e.g., ḥ or ḩ versus h). Some other phonemes may be romanized with a digraph or diacritics (e.g. kh or ḫ). The short vowels are not written in Arabic. Their pronunciation and romanization can vary across dialects. Arabic names and terms are used by Muslims in many countries, and the spelling of phonemes varies across languages. For example, the Arabic letter shīn (ش) is written by English speakers as sh. French speakers render the same letter as ch, and Malaysians as sy. The letter jīm (ج) is written as j in English if it is pronounced as “soft g” (see below), but it will be spelled as dj where French influences the spelling. The Arabic ḍāḍ (ض), an emphatic letter, is often spelled dh by South and Southeast Asians, so they spell the month of fasting as Ramadhan. So How Do You Spell…? When I am asked how to spell an Arabic name or term in English, I usually ask what is being written (e.g., an academic paper, a trade book, a letter, a journal article) and who is the audience. If you’re deciding the spelling of your child’s name or writing something for a general reader, my answer will be different than if you are writing an academic paper. If you are writing an academic paper, several different systems for romanizing Arabic exist. If you are writing or editing a scholarly text, you will have to follow the publisher’s preferred method. The Chicago Manual of Style recommends ALA-LC Romanization Tables: Transliteration Schemes for Non-Roman Scripts and the IJMES system of the International Journal of Middle East Studies. There are others. If you are completing a form or writing for a general reader, I usually recommend a simplified spelling without using diacritics. If you are writing Islamic materials for a general audience, you might prefer to use diacritics for Islamic terms. Editors have asked me about spellings when their non-Arabic-speaking authors apparently took materials from various sources that used different systems of romanizing. Whether you choose to use diacritics or not, be consistent in spelling or transcribing terms. Place names and personal names are more difficult. Names of recent and living people will unlikely be transcribed following an academic system, but there are exceptions. I indexed a book on Arabic literature in which the names of authors who had only published in Arabic were transcribed with diacritics, even if their works were well known in translation. Thus Nobel Prize–winning Naguib Mahfouz was written as Najīb Maḥfūẓ. If recent and living people have a preferred spelling for their name, use that. If a personal name or place name appears in the news or is otherwise well known, use that spelling. If there is variation between news sources, choose one and stick to it. In Part 2: Other Challenges for Editors, I discuss some other features of Arabic that may cause problems for editors and writers who are unfamiliar with the language. The hardcover version of Garner’s Modern English Usage (GMEU) weighs in at 1,120 pages and 5 lbs., making it impractical to carry about with you, so having an app for phone and tablet is a convenience if you edit on the go. I work at home and at my office. Normally, my hardcopy of GMAU is at my office desk (I’ll update to the current version anon). It’s not a book I want to lug back and forth. If you like to work at coffee shops or travel frequently, there’s a good case to get the app. If you work in one setting, maybe not. With the app, the digital index allows for rapid searching, displaying the results as you would find them in the paper text. This is a case where a digital reference book competes well with its physical version. This type of app is also useful when you need to check a usage question but don’t have internet access. There are a number of usage guides available as apps from the iTunes store, such as the Oxford A-Z of English Usage and Practical English Usage (also available for Android at the Google Play Store), but they tend to skew toward British English. Whether you work solo as a freelancer or in-house with a team, you’ll find yourself in situations where you want the advice of a wise colleague. Perhaps you’re unsure if an expression is in the correct register, or if a word is a proper synonym of another. You can often obtain the answers you want with an online check. When you can’t, you turn to a usage guide for that voice over your shoulder. The internet is excellent for rapid spellcheck. As a medical editor, I’m constantly looking up anatomical terms, the names of diseases, and the names of persons. The typical usage guide won’t be much help there. But for grammar and usage questions like, “different from” versus “different than,” a usage guide will walk you through the matter in detail. If you’re familiar with the online sources that are authoritative in answering such questions, a rapid online check will resolve your question. The Chicago Manual of Style, and Grammar Girl, and The Grammarist are generally reliable for quick queries. For more problematic questions you’ll turn to your reference shelf and the books you’ve chosen will give you consistent guidance. Laypersons — but not professional editors — can get by with Strunk and White’s Elements of Style, Lynne Truss’s Eats, Shoots and Leaves, or Nevile Gwynne’s Gwynne’s Grammar, as these are prescriptivist in tone, offering the reader a sharp-tongued schoolmarm who will champion (questionable) rules and exhort you to “do X, not Y.” I wouldn’t advise those texts to anyone, personally, but they’ve found a ready market. Garner, on the other hand, is a voice of reason who eschews petty prescriptivism, while offering more guidance on usage and style than the free-wheeling descriptivism of Merriam-Webster’s Dictionary of English Usage. 1 Rejected: People normally consider innovations at this stage to be outright mistakes. 2 Widely shunned. Has spread to a significant portion of the language community, but is unacceptable in standard usage. 3 Widespread. Becoming common but still avoided in careful usage. 4 Ubiquitous. Virtually universal but still opposed on cogent grounds by a few linguistic stalwarts. 5 Fully accepted. Universally adopted except by a few eccentrics. This is an abbreviation of how his approach allows for degrees of nuance. In the “Preface to the First Edition,” Garner mentions some of his influences, one of whom is Theodore Bernstein, author of The Careful Writer, among other books. Bernstein had an intimate familiarity with false rules, zombie rules, and the like, combatting them in his Miss Thistlebottom’s Hobgoblins. Whether you accept Garner’s judgment regarding the status of a term is up to you. His classifications are based on a number of sources. The exemplars he presents are taken from his personal reading and those submitted to him by his network of colleagues, friends, and persons who work in linguistics. I find that his assessments are generally in accord with my own sense of the language and are trustworthy. For example: Under “Octopus,” he notes that for the plural, “octopuses” is overwhelmingly approved in American and British English, whereas the false Latinate “octopi” is largely considered a fault, and so he relegates it to Stage 3. He likely is drawing from a corpus of citations and rendering his opinion from instances in print or using his own judgment; in no cases have I found his assessments to veer from my own observations. And as Garner explains the approach he’s taking with GMEU, he clarifies that it’s directed for the general and professional writers who want to be as correct as possible, and elegant and powerful in their prose. What is often sought by those consulting a usage manual isn’t permission, but learned opinion; “Tell me what the best writers do,” the reader is asking. The usage examples Garner presents in GMEU are always taken from actual citations, so you can examine how other writers approach grammatical problems as they appear in the real world. GMEU contains much more than a list of words commonly misused. Its essays are informative and include “Back-Formations,” “Clichés,” “Etymology,” and so on. These appear throughout the text where logically warranted, and can be accessed directly from a separate index. In addition to usage, there’s considerable advice about document design and layout. For editors, he includes a list of 100 editorial comments, which you can select by entry number and in page markup indicate, for example, “See Garner GMEU, ‘Editorial Guide’ entry 15.” If you know your author has a copy of this text, this could be a timesaver. The idea being that if you have GMEU and your author has GMEU, this could work as a shorthand. I’m not sure how likely this is, but it’s offered in that regard. Also of note is a quiz section – natural for an app-based work, with 300 questions to test your understanding of common editorial problems (warning: they’re hard). The scores reset when you close the app so you can retake the quiz. You don’t have to work with this text long before you realize the impressive amount of research and thought that’s gone into it. Garner doesn’t make proclamations by fiat but rather offers support and citations for his opinion. And while the classics by Fowler, Bernstein, and Copperud deserve a spot on any language maven’s reference shelf, those authors are long deceased, albeit Fowler has been updated by Butterfield in Fowler’s 2015 4th edition and remains current. If you have an interest in knowing where the battle lines in English have been drawn, a hardcopy of GMEU is a good purchase. If you work in multiple settings travel frequently and work away from your desk, the app might prove useful. Freelancers working in multiple settings, editors on assignment abroad, and people who want to access this work on the move may find this app to be the right choice whether or not they own it in hardcover. As I have noted many times on An American Editor, editing has changed greatly since I began my career nearly 33 years ago. Many of the changes are small and relatively inconsequential; others amount to sea changes. All have added to the burden of the job. The most problematic changes for me are the triad of increased tasks to be performed in less time but for the same or less pay. This triad denotes a change in emphasis. Thirty-three years ago, budgets weren’t unlimited but priorities were different. The goal then was a better book (manuscript) even if the schedule had to be stretched, the budget increased, or some of the less-important tasks skipped. Today, it is the schedule and budget that reign supreme, especially the schedule. There really isn’t a great deal wrong with the fragment, especially in the Twitter age where people are increasingly thinking in 140-character fragments, except that given time to think about what we are reading should raise questions that are at war with an editor’s goals of making the language such that all readers receive exactly the same author message and of answering foreseeable questions before they are asked. Was the subject of the report a crime that had been committed by Kroll? It was not until April that much information about the bank scandal became public, after the speaker of parliament leaked a report on the crime committed by Kroll, a security firm. It was not until April that much information about the bank scandal became public, after the speaker of parliament leaked a report on the crime written by Kroll, a security firm. Note the words in bold in each revision: committed and written. The addition of just the one word to the sentence enhances and clarifies the meaning. And because either word fits neatly within the confines of the sentence — with no other change to the sentence, just the insertion of the single word — it is clear that the sentence as originally written (i.e., with the omission of either committed or written) could mean either that the report was written by Kroll or the crime was committed by Kroll. All that context does is give some weight to the credibility of an unstated premise that many readers will unconsciously draw. Thus, the importance of time to contemplate. I know from my experiences as an editor and as a reader that the minimizing of an editor’s time to contemplate what the editor is reading in a manuscript has become a seismic change in publishing. Increasingly one cannot rely on, for example, a nonfiction book to be accurate, only that it approximates being accurate. Too many sentences appear in books of “fact” that rely on the reader drawing the correct premise from a well of premises. It nearly goes without saying that the problem of lack of contemplation time, as brought about by the earlier-mentioned triad, is compounded by the increase in self-editing and in the expansion of the editor pool by the inclusion and use of un-/less-/underqualified or nonprofessional editors. Self-editors would not stumble over the sentence because they innately understand what their words mean; it is no different than writing their instead of there and not catching the mistake when you reread what you have written. Similarly, underqualified and nonprofessional editors would pass over the phrasing because of the subtlety involved in recognizing that there are not only two possible opposing meanings (committing a crime is opposite writing about a crime committed by someone else), but that interpretation of the sentence as written requires selecting the correct underlying premise — which itself may be a false premise — from the well of premises. Because of this, while intrastudy interpretations of serological data from clinical trials with Vi conjugates are possible, heretofore comparisons of different conjugates cannot readily be made as two different conjugates have not been used in the same randomized study for direct comparison. Because of this, while intrastudy interpretations of serological data from clinical trials with Vi conjugates are possible, heretofore comparisons of different conjugates could not readily be made as two different conjugates have not been used in the same randomized study for direct comparison. Because of this, while intrastudy interpretations of serological data from clinical trials with Vi conjugates are possible, comparisons of different conjugates cannot readily be made as two different conjugates have not been used in the same randomized study for direct comparison. Sentences like the above get passed over because of the pressure of schedule combined with low compensation and the increased number of tasks that a client expects an editor to complete within the allotted time for that low compensation. Something has to give, and what has given is the time needed to contemplate sentence structure and the order of words. Professional editors do the best they can within the parameters forced on them by clients. But perhaps we — meaning both professional editors and clients — need to step back and rethink the sacrifices that are being made in order to meet the demands. Should we continue to sacrifice clarity upon the altar of schedule? Should we continue to sacrifice the author’s message to the triad? These are the questions that editors and clients need to address before it becomes acceptable for every manuscript to look like it has been twitterized. The science of editing is mainly concerned with technical rules and procedures, things you can apply with recourse to established rules and style dictates, the rules of formal grammar, and orderly checks that bring documents into consistency with themselves. The art comes into play when you need to apply judgment or opt to break the rules when doing so results in a better read. The theme of this essay comes from a class I took in teaching English as a second language, in which the instructor asked, “Do you think teaching English is an art or a science?” The answer of course was, “A bit of both.” I’ve found this to be true in the craft of editing as well. How much of each quality one brings to the task is an individual matter, but there are instances where you see each play out. For example, if you are concerned about which preposition to use with “different” (from, than, to), that is a widely commented subject addressed by virtually every style guide — you can look it up. Any question about style and usage that can be addressed this way lies on the “science” side of the equation. Editing by pure instinct is conceivable, but the job ultimately requires both talent and study. You might work with a mentor, research grammar and style problems online, and read books about editing. If you want formal training, there are certificate programs like the Poynter ACES Certificate in Editing, and Copyediting.com offers courses and webinars on editing. If you’re an editor or want to become one, it’s a given that you have more curiosity about English and writing than most. It’s virtually guaranteed that when you encounter a word you don’t know, you look it up and add it to your vocabulary. Other parts of the science are the specific skills and habits you acquire through experience. You probably have a long list of words that you know you should always spot check because they give you trouble (for me, hemorrhage, Mediterranean, and ophthalmology are cases in point). You make style sheets as you go along. You develop checklists. These are all learnable skills. If you spend time on social media and watch the conversations writers, editors, and language learners have among one another, you’ll see cases where questions arise that do not have clear-cut answers. These can be matters of comma placement, position of the word “only,” epicene “they,” informal intensifiers, and types of redundancies. Here’s where matters of taste and judgment come to the fore. Is this fragment allowable? Is a semicolon in this position too fussy for the text? Does this “whom” sound pedantic? No text will solve these problems — your feel for the language and the context will be your guide. Some people opine that you don’t have to be a good writer to be an editor. Enough respectable editors say this that I can’t dismiss it out of hand, but it is surely an “art” question. In polling some of my colleagues the consensus is that for straight copyediting and proofreading, it may be possible to do the work without strong writing skills. But for developmental, structural, and line editing, the editor will need to know what good writing looks like, be able to spot clunky wording, and smooth over rough passages. Reading widely and often is the ticket. To be sure, some of your best catches come from editorial intuition — something has jumped out at you and you don’t know why. And that is a signal to look closer. As a case in point, I recently had one of those moments. The sentence in question was: “Average HDL was 50–59 mg/dL in men, 40–49 mg/dL in women.” What was wrong here? I knew that “mg/dL” was correct — the usual error you see is “mg/dl.” I looked it up; the figures for men and women had been reversed. The commenters who focused on the styling of the date checked the publisher, determined that it was indeed a UK-produced text and were pleased to report back that in British English, this ordering of the date was preferred style and there was thus no error as presented. Focusing too tightly on the mechanics can lead to misses like that. Because there are so many things to check in a typical manuscript, relying on memory alone is likely to fail you at some point, so style sheets and checklists are helpful tools. With the kind of material I handle, after the general read and line editing, I’ll run through a document several times more looking for specific problems, such as errors in names and publication titles (which are common). Your style or working environment may not allow for this technique, but I’ve found it useful if time and resources allow. Be aware of the specific skill-sets that each duty will require. Recognize that it is very common that these two positions may be filled by one person at a time. In A, it’s possible to remove the bolded “that.” But the bolded “that” in B follows a verb and seems to have a stronger hold on life. Bryan Garner in Garner’s Modern American Usage calls this problem “wrongly suppressed that” (3rd ed., pg. 808). He notes that when clauses follow certain verbs or nouns, “that” can be an effective signal to the reader preventing a miscue or ambiguity. For example: “The belief you are unable to recognize your own voice is common,” is a miscue because a conjunctive “that” before “you” would clarify that a relative clause is following, as opposed to “a belief you are following…” And “The officer acknowledges being too fast on the draw is a common mistake” is ambiguous because without a “that” before “being” we can’t be certain if he is referring to himself or others. The use of style sheets and checklists is one way editors obtain consistency and maintain quality in publications. You might have a house style sheet, which applies to all documents, and a project style sheet, developed during the edit of a specific work. Checklists are similar, and they encourage the practice of making multiple passes through a text, each time focusing on one or two particular issues. Practice and experience will inform your style, which raises the question of how long, exactly, this might take. In his book Outliers: The Story of Success, Malcolm Gladwell claims that 10,000 hours of study is the baseline metric for achieving mastery in most advanced skills (although later he clarified that his meaning is that extensive practice is needed, but not necessarily sufficient, to master a skill). But because the editor is attempting to master English to the greatest extent possible, I would argue that one never “masters” this particular craft. You can only improve your ability over time. Most editors I know possess a range of reference books, style guides, and books about grammar and usage. If you encounter a problem or find yourself wanting to make a change and you don’t know why, it’s good to have tools on hand that explain the matter. Know where the battle lines are in debates that remain unsettled (such as the epicene “they”). And it’s good to have a mentor or belong to a mastermind group where you can exchange ideas with colleagues in the field. A major portion of the editor’s job, when line editing, is to cull extraneous words and tighten up the text. This may be less relevant in the editing of fiction or poetry, but even in those cases, careful pruning is essential to facilitate the emergence of the writer’s voice and intent. In practice, typically, 15 to 20 percent of the textual content you’re working will be deletable. Accordingly, if I want a 1,000-word story, I’ll assign the writer to give me around 1,200, as after the edit the text will be the right size. The problem here isn’t that most authors are too chatty, but rather it’s the result of the writing process itself. To get into a good flow and rhythm, writers usually write the way they think and speak. It’s the advice I give to new authors: “Avoid trying to sound like a writer.” But spoken English contains a great number of words, phrases, and linguistic strategies that are performative discourse markers. If you’re interested in the philosophy of language, Speech Acts by J.R. Searle (1969, Cambridge University Press) built on the work of Ludwig Wittgenstein’s ideas of language and game theory and J.L. Austin’s How to Do Things With Words (1975, Harvard University Press; 2nd Revised ed. ), and makes the argument that language isn’t merely used to talk about things, but it is largely used by speakers to do things. These terms give the speaker time to consider what should follow, and the listener time to prepare for it. Such language can usually be cut to good effect. You remove all of these needless words, unless they are vital to the meaning of the text. Usually they aren’t, but the writer was talking to the reader and that’s likely how so many of these fillers slip in. Sometimes an entire paragraph or two will be a digression and you’ll mark it for wholesale deletion. The writer’s point was already made. No need to belabor it. In some cases, however, the text must lose more than the expected 15 to 20 percent. Perhaps in the editing more than half has been deleted and you’re still cutting. Possible reasons are that the author didn’t have a good idea — or any idea — before sitting down to write. The result is a long meandering text that goes nowhere. It might be that the text is inappropriate for the publication, or that it’s offensive in some fashion. I was once given a manuscript that concerned the journey of a band of elves and dwarves, led by a fair maiden and a wizard (sound familiar?). Each chapter consisted of a day in the journey, a tedious, slogging affair; characters were introduced with extensive laundry-list descriptions that began with the tops of their heads and proceeded vertically down their bodies. There isn’t much to be done with a derivative, badly executed work. If you try to correct the structure, you still have a duplicative text. If you try to revise the plot from a structural standpoint, the mechanics are still so lacking that your only available move is to recommend that the author start over from scratch. In any of these cases, in your judgment the work is unsalvageable and it isn’t worth your time and labor. Even if you need the money, you might deem it unethical to work on a text that you know has no chance whatsoever of being an acceptable read. In such cases, you’ll have to deliver the bad news. I’ve found that rejecting a novel is difficult given the time and effort that went into it. So a cover letter explaining your rationale is a wise move. Try to point out anything that did work (if such exists), offer helpful comments, and guide the writer to your conclusion as gently as possible. Some might argue here for “tough love,” yet I’d counsel sensitivity to the author’s ego, which is going to take a major blow. There’s no reason to make it worse than it has to be. But when the patient is dead on the table, you’ll have to deliver the bad news as best you can, knowing the usual approach is largely unavailable to you. Today, given the ease of indie publishing, we are awash in texts written by people who toy with the idea of writing a book, but are lacking the skills to actually accomplish the task. Elliot, following the first read of this story, I was able to see where you are trying to go with it. I made notes on the text and also in a separate document, which is attached for your review. While at first I was planning to indicate the range of adjustments this story needs to work effectively, it became apparent that there are some fundamental issues that need to be resolved that lie beyond the scope of a general edit…. As you get stronger at your craft, you may widen the scope of what is salvageable, but prepare yourself for those occasional times when your only possible recourse is to bury the body.